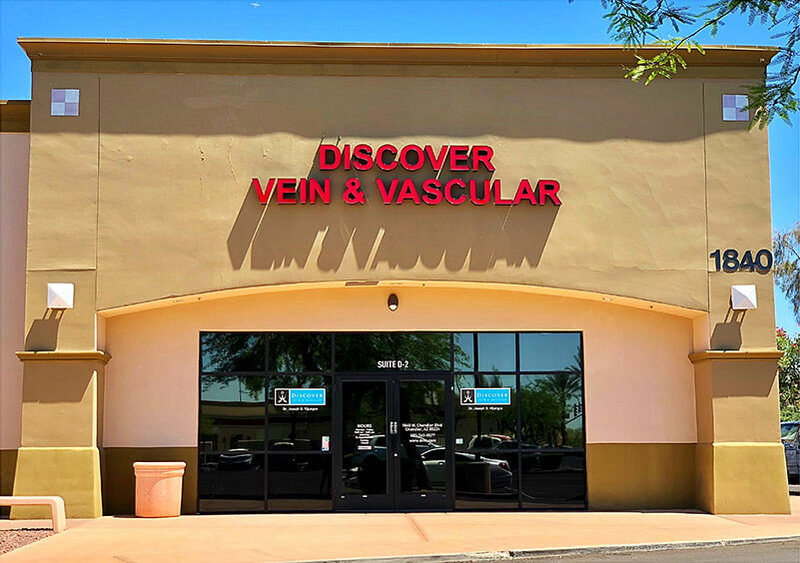 Since 2012, Arizona's Discover Vein and Vascular Center in Chandler & Mesa AZ is passionately committed to providing nothing but excellent vascular services to our patients. We treat a complete range of peripheral vascular complications - carotid disease, aneurysms, peripheral arterial disease (PAD), renal artery stenosis, mesenteric artery stenosis, dialysis access creation, venous insufficiency and varicose veins. At the helm of DVVC is Dr. Joseph Vijungco, noted as one of the top vein & vascular doctors in Arizona. Not only is he the top vascular surgeons Arizona has to offer, he was also named America's Top Surgeon by the Consumers Council of America. Our highly trained DVVC team works together to ensure that we provide the best vascular care for every patient, every day throughout the Mesa, Chandler, Scottsdale and Phoenix AZ area. We are committed to provide complete and comprehensive care to our patients in our state of the art facilities. We strive to continually work with our physician colleagues in the management of any vascular problem, to provide education to the community about the risk factors associated with peripheral vascular disease. It's this commitment to our community, innovation and to our field of practice that makes our work so rewarding. This and the fact that we we are being led by one of the best vein doctors in Phoenix is what has led to position DVVC as arguably the best Arizona vein and vascular center in the state. Dedication We are committed into providing the highest quality of care for every patient – every day. Innovative We offer a state of the art facility with a team of experienced, Board-certified specialists with well-earned reputations for excellence. Satisfaction We strive to make sure our patients are satisfied, feel comfortable and get the best results. Compassion We respond with care and empathy to the needs of our patients and family members. Outstanding We ensure our patients the least recovery time that give long term outstanding results. Excellence We strive to attain the highest standards of performance and outcomes. Respect We respect all personal and value their differences. Dr. Vijungco is a board certified vascular and endovascular surgeon. He has a wealth of experience in the management of advanced arterial disease and venous disease.